Plain and Ornamental, including German, Old English, Saxon, Italic, Perspective, Greek, Hebrew, Court hand, Engrossing, Tuscan, Riband, Gothic, Rustic, and Arabesque, with several original designs, and an analysis of the Roman and Old English Alphabets, large, small, and numerals, for the use of draughtsmen, surveyors, masons, decorative painters, lithographers, engravers, carvers, etc., etc., collected and engraved by F. Delamotte. London: Crosby Lockwood and Son, 7, Stationers' Hall Court. 1891. Calligraphers and sign painters' reference. 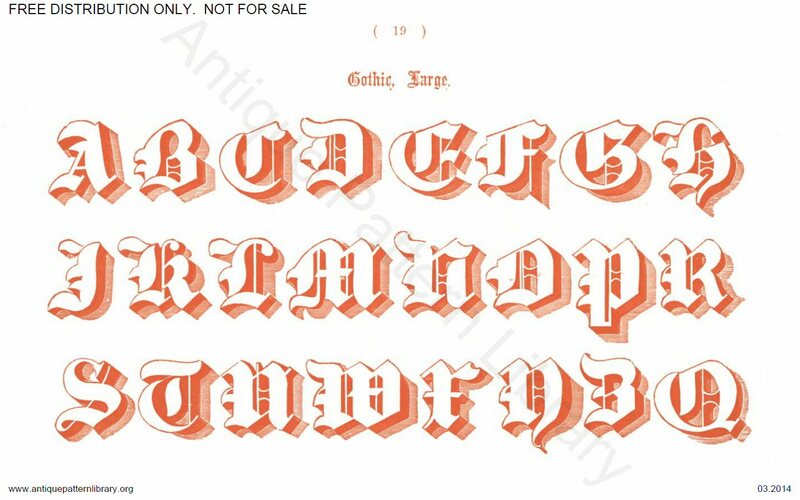 48 plates of alphabets, initials and symbols, very typical of the ornate usages of the 1890s. Advertisements for the other calligraphy manuals, and a short introduction. Includes a Hebrew and a Greek alphabet.